Review of the AO Smith power vent water heaters from Vertex and ProMax series, including high efficiency and low NOx models. 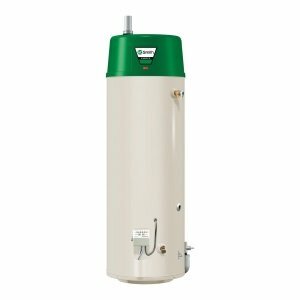 AO Smith manufacturer offers over twenty tank-type, power vent gas water heaters that utilize the metal tank with the capacities from 40 to 75 gallons, and divided in two sizes: short and tall. All the models are coming from two groups: ultra-efficient Vertex and ProMax, both powered by natural and propane gas. Vertex is the only super-efficient model from all AO Smith power vent water heaters that is capable of providing a thermal efficiency of over 90%. Vertex is equipped with the 50-gallon tank and can deliver over 92 gallons of hot water in one hour and water flow of 3 gallons per minute, continuously. The environment-friendly and top-fired gas burner helps the water heater in reducing the emission of NOx gases and together with the spiral heat exchanger increases the efficiency which saves the energy and money. The advanced electronics allow better and precise control of the water temperature and makes the troubleshooting easier. 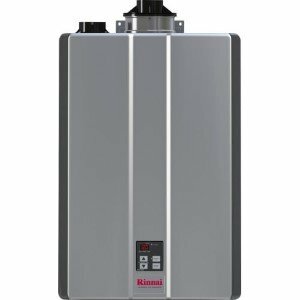 ProMax Power Vent Higher EF are high-efficiency water heaters that are designed to maximize the efficiency and performance. As the Energy Star approved, ProMax water heaters save money and time while protecting the environment with the low NOx gas combustion. The main features include the DynaClean II system and its specially designed dip tube for the optimized water heating and protection against the sediment build-up inside the metal tank. The most applied pilot light has been replaced by the hot surface ignitor, which is not only more reliable feature but saves more energy. The metal tank is protected with the Blue Diamond glass coating and factory installed anode rod. Power vent design brings the great versatility as its vent pipes can be installed horizontally through the outside wall and vertically through the roof. Such an enhanced flexibility brings you more options during the installation especially with the use of the 3-position rotatable blower outlet. The pipe can use various materials: PVC, ABS or PP and can run up to 180 feet, making them perfect even in homes with the limited space. The advanced gas control valve increases the accuracy in temperature control and makes diagnostic easier. The protected sensor and air intake snorkel enhance the safety since the combined system prevents the accidental ignition of the flammable vapors. 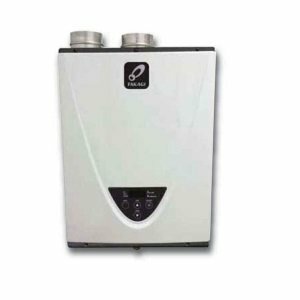 AO Smith power vent water heaters from Ultra-low series utilize the advanced burner system that combines the radiant heat and access air to increase the energy efficiency to 0.68 while providing the gas combustion with the reduced amount of greenhouse gases. The burner system uses the high-quality materials and is more efficient and durable than the standard type. The Ultra low NOx water heaters are equipped with the Coregard anode rod and the DynaClean dip tube for protection against corrosion and sediment build-up. Ultra low models utilize the FVIR system with the flame arrestor. 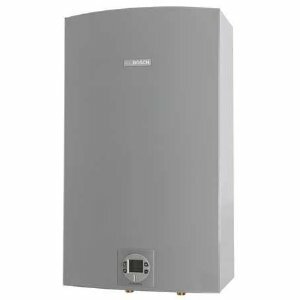 Hybrid power vent water heater GPH 90N does not belong to the conventional type gas appliances, but it combines the best from tankless and tank-type technology resulting in the high energy efficiency and First Hour Rating. The innovative technology includes the patented circulation system that ensures the best performance and other benefits. All the models that comply with the Energy Star requirements, such as the High EF and Ultra-low NOx series, provide more energy and money savings than the SL series, which doesn't comply. The above models are factory built to use natural gas, while propane models have the same specifications and warranty of 6 years.